Backyard Debutante is loosely based on the White-Crowned Sparrow. I always enjoy seeing these little birds with stripes on their heads. The White-Crowned has 3 stripes which I simplified to one in the interest of clarity and simplicity. 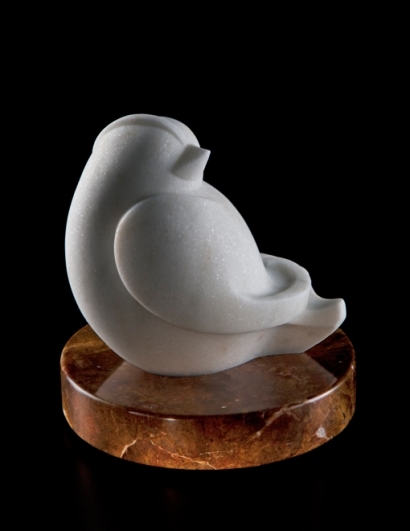 This stone sculpture is also about curves, with the contrasting exception of the straight lines of the beak. The Vermont marble has elegant crystal, evident in the photo, and ideal for this debutante. The Sculpture in the Park show is the highlight of my year and is held here in Loveland every August. I have included a shot of my booth on the night of the Patron Party. The show was fantastic this year! Thank you to old and new friends who stopped by to say hello and see my work. This is my only chance to connect with you in person, and I love the opportunity to chat with you about sculpture. This was a very successful show for me. Four of my pieces found homes: Spotted Dove, Backyard Debutante, Sky Life, and The Last Dinosaur. I admit I was nervous about the show due to the recent economic ups and downs. A sculptor friend remarked that there will always be a desire and need for art, and I was pleased to find that this is true. I am also pleased to write that, due to the sale of The Last Dinosaur, I am able to donate a percentage of the purchase price to help protect Leatherback Sea Turtle nests and nesting beaches. This is a wonderful feeling of empowerment to be able to contribute to save a magnificent animal. 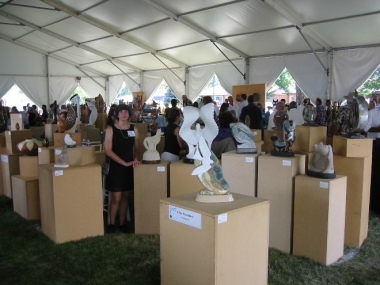 Ellen Woodbury’s booth at Loveland Sculpture in the Park, 2011. Next on the carving block is an elegant 240-pound block of Turkish Red Marble. The sculpture will be a Red Panda, an Asian species endangered due to loss of habitat. The facial markings of this animal somewhat resemble our raccoon and I am looking forward to bringing that delightful face out of the stone. Speaking of which, this is a very hard marble with a deep maroon color. I saw a beautiful abstract sculpture at the show carved from this stone by Jack Haggerty and am very excited to begin my panda.